Home » Sectors » Health » Health Insurance For Poor: Fact or Myth? Health Insurance For Poor: Fact or Myth? I read this article and found it very interesting, thought it might be something for you. The article is called Health Insurance For Poor: Fact or Myth? and is located at https://archive.indiaspend.com/sectors/health-insurance-for-poor-fact-or-myth. The Indian government has promised health insurance for all families below the poverty line, and has allotted over Rs 2,800 crore for the programme till now. IndiaSpend’s Bhumish Khudkhudia finds out more about Rashtriya Swasthya Bima Yojana, which has been selected by International Labor Organization and United Nations Development Program as one of the 18 innovative case studies from around the world in the field of social protection. Rashtriya Swasthya Bima Yojana (RSBY) was launched in October 2007 by the Indian Ministry of Labour and Employment to provide health insurance coverage for below poverty line (BPL) families in the unorganised sector. Low public health spending and lack of healthcare financing are key reasons for poor health outcomes and financial burden on low income households in India. And the objective of RSBY is to provide protection to BPL households from financial liabilities arising out of health shocks involving hospitalisation. Beneficiaries under RSBY are entitled to coverage up to Rs. 30,000 for most of the diseases that require hospitalisation. Coverage extends to five members of the family and beneficiaries need to pay only Rs 30 as annual registration fee. The central and state governments pay the premiums to the insurer selected by the state governments on the basis of a competitive bidding. 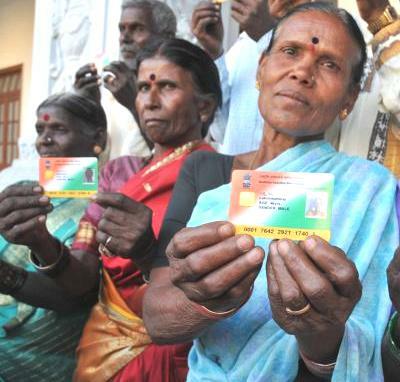 So far, 32.34 million smart cards have been issued under the Rashtriya Swasthya Bima Yojana. The government has also reported hospitalisation cases of 4.07 million as on August 30, 2012. The RSBY smart card is used for a variety of activities like identification of the beneficiary through photographs and fingerprints and information regarding the patient. The most important function of the smart card is that it enables cashless transactions at the empanelled hospital and portability of benefits across the country. Bihar has enrolled more than 7.4 million BPL families across 30 districts. Gujarat, Kerala and Chhattisgarh have seen complete enrollments in all the selected districts. Karnataka is yet to complete enrollments in any of the selected district. About 75% of the financing is provided by the central government while the remainder is paid by the respective state governments. The central government’s contribution is 90% in the case of North Eastern states and Jammu and Kashmir. The beneficiary is also paid Rs 100 per hospitalisation as transportation charge with a maximum limit of Rs 1,000 during the policy period. The total allocation for Rashtriya Swasthya Bima Yojana in Union Budget 2012-13 is Rs 1,568.56 crore, which includes Rs 118.56 crore from National Social Security Fund and Rs. 350 crore from the department of rural development for extension of the scheme to MGNREGA workers. The central government has already allocated nearly Rs 2,800 crore for the programme since inception. According to experts, strong support from the state governments is a key factor for the success of RSBY. Rajasthan had initially implemented the scheme but stopped after a year. The state government didn’t market it adequately but has once again initiated the process. Tamil Nadu, too, participated in the scheme initially but discontinued. It launched its own initiative in 2009 called Kalaignar Insurance Scheme for life-saving treatments. Andhra Pradesh has not participated in the RSBY programme as it has its own health insurance, the Rajiv Arogyashri Health Insurance Scheme. On the other hand, Karnataka, which has its own scheme called Yeshasvini Cooperative Farmers Healthcare Scheme, is actively implementing RSBY as well. USD 0.67 setup fee by beneficiary + 75% by Centre 25% by State. Arogyashri in Andhra Pradesh initially provided hospitalization cover but its package expanded to include critical illness. Kalaignar, which operates in Tamil Nadu that has a more robust and functional public health infrastructure, also covers critical illness. There is a marked variation in the average cost of hospitalisation, which can be attributed to four factors: the type of medical risk covered, the profile of households targeted, the rising healthcare costs in the region, and the scheme’s ability to negotiate rates with health providers. While the average cost of hospitalisation under the Karnataka government’s Yeshasvini scheme was Rs 8,000, the average cost under the Kalaignar scheme was Rs 33,700. Yeshasvini also continues to have high utilisation rates. It could partly be attributed to client contribution, which increases awareness and induces usage. The concern with the scheme is the rising average claim ratio (157 per cent in 2010). There are 39 central government-sponsored insurance schemes including Aam Aadmi Bima Yojana (AABY), Janashree Bima Yojana (JBY), Shiksha Sahayog Yojana, Varishtha Pension Bima Yojana and Universal Health Insurance Scheme. Like many other government schemes, there are overlaps without clear mandates, and hardly any awareness among the beneficiaries. The Economic Survey of 2011-2012 has highlighted the issue of convergence of programmes. According to the Survey, despite a lot of talk, nothing has been done on convergence. However, there have been some other positive developments recently. The finance ministry will now use the Rashtriya Swasthya Bima Yojana mechanism to provide life insurance cover to the poor under JBY. There is demand for space in the RSBY chip for housing other additional socio-economic and health-related data as well. Other government schemes related to pensions, etc. may also ride on this card in the future. RSBY has managed to provide protection from healthcare expenditure to millions of poor people in India. Realising its effectiveness in reaching out to the beneficiaries, the government has already decided to extend the scheme to many other categories of unorganised workers. Many NGOs have also shown interest in using the RSBY platform. A number of developing nations are in talks with the government to see how the scheme could be adapted and implemented in their countries. In fact, International Labor Organization and the United Nations Development Program have selected RSBY as one of the 18 innovative case studies from around the world in the field of social protection. In addition to health insurance, the smart card platform under RSBY is now also being seen as an instrument that can be used to deliver different social security benefits to the vulnerable sections of the society in an effective and transparent way. Yes, I too agree that the govt in India launches many such kinds of stuff around the country but one should look at how many people really get the benefits which the govt promised to give them. Trust me not more then 20% people avail their benefits in such kind of policies especially in India !